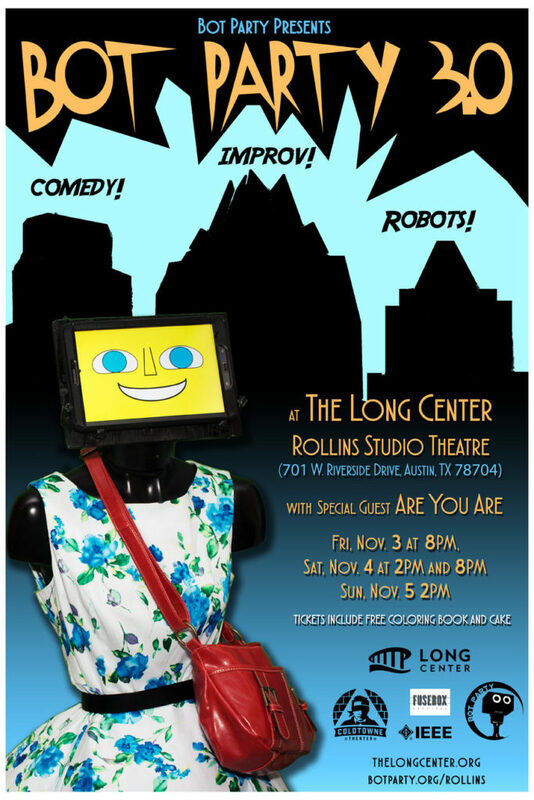 Bot Party presents Bot Party 3.0 with special guest Are You Are, November 3 – 5 in Rollins Studio Theatre. Bot Party 3.0 is a family-friendly mashup of Whose Line Is It Anyway and Battlebots, with humans and live semi-autonomous robots competing for your laughs! Regularly featured in SXCreate and Maker Faire Austin and produced in partnerships with ColdTowne Theater and Fusebox Festival, Bot Party characters explore the very best in Artificial Stupidity. Show features games, cake, coloring and long-form improvisation from special guest, Are You Are. Reverie Report: Will robots ever improvise?